Do you want to know how is behind Kretawandern? We introduce us! 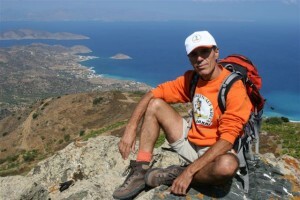 I choose the name Kretawandern (Cretehiking) because I start there my career and Crete is my base! My name is Ioannis (short: Jannis) Alexandridis. I am born 9th August 1958 t in Thessaloniki. Since my teenager time I liked the contact with people from other countries and their cultures. When I finished school I started to travel and after the army service I left from Greece. First I went to Switzerland, where I learned the german language. Today after almost 30 years, german is my second mother language. So I speak three languages (greek, german and english). In Switzerland I worked 4 years in the gastronomy in several restaurants and hotels. After that I went to Austria in Steiermark, but only for 6 months, because I coulden’t get a residence permission. So I mooved to Germany. In Germany I worked in the gastronomy 2 years, untill I got a job as a representative for a south german tour operator. My first destination was Crete. This happened in the year 1992 and since then I live half in Germany and half on Crete. I worked 3 years as a representative and then I changed. For 1 year I organized and accompanied sailing trips. After that I worked as an entertainer (animation) in 2 hotels. In the year 1999 I decided to work as a hiking guide, which was my favorite hobby. That way I could be free in the natur and creative. I have two trainig as a guide, one in Greece and one in Germany and 13 years experience. In this periode I tried many things. I organized and guided hiking trips all over Crete and other greek islands, as Corfu, Kos, Karpathos, Kythira, Thasos and Peloponisos for travel offices, hiking clubs and private groups. Since 10 years I organize seminars for the univercity of Paderborn. Occasionaly I offer hiking holidays combined with greek cooking courses , or I cooperate with dancing and painting teachers for greek dancing and painting courses. General I offer to my guests only what I like for my self. In 2005, after stimulation and support of some hiking friends, I have established an Olive oil distribution in Germany. In 2006 I attended a seminar on olive oil tester, so I became olive oil expert. I buy the best organic olive oil in Crete and sell it in Germany. You can find out more on the Internet: www.olivenoelfreunde.eu . To my farther interests belong spirituality and humanity. I philosophize gladly and looking always for ways to find my center and to live a happy life, with each other and for each other. I cultivate friendship, peaceful communication and freedom and dream of a world full of love. Now I want to introduce a good friend and colleague. Angela Panagopoulou. She is an Austrian who lives longer in Crete, as in her homeland. She works since many years with groups, loves hiking and the rich Cretan flora. She is trained as a mountain guide in Austria, in the Steiermark. She speaks German, Greek, English and Dutch. She is my first choice, when I have a lot of work and need help. It gives us pleasure to show our guests the beauty of Crete, far from mass tourism. Respect to nature, to our country and to our guests, as well as quality and safety are our highest bids. We know the island very well and choose only the best tours. We have great knowledge and a lot of information, to work out specific programs. Thus we are able to show our guests the best of Crete and Greece. And what about you? When do you come, with us hiking? We look forward to give you a warm welcome!